Give It Up for the Kidneys: Where Else Would You Want Your Blood Filtered? 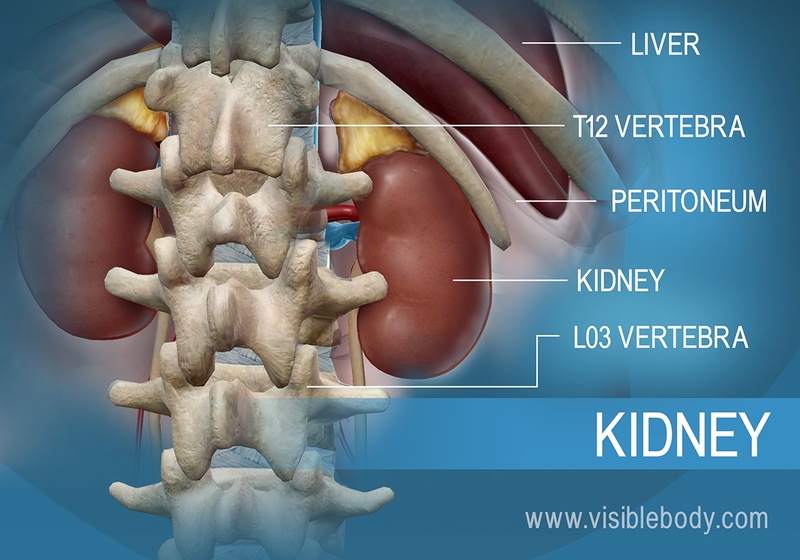 The kidneys sit in the back of the abdomen between the levels of the T12 and L03 vertebrae. 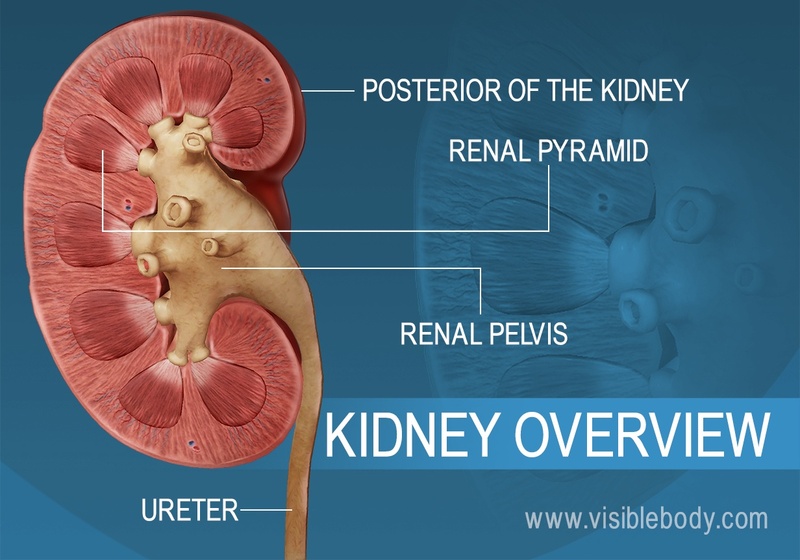 The kidneys sit at the back of the abdominal wall and at the start of the urinary system. These organs are constantly at work: Nephrons, tiny structures in the renal pyramids, filter gallons of blood each day. The kidneys reabsorb vital substances, remove unwanted ones, and return the filtered blood back to the body. As if they weren’t busy enough, the kidneys also create urine to remove all the waste. The kidneys are located behind the peritoneum, and so are called retroperitoneal organs. They sit in the back of the abdomen between the levels of the T12 and L03 vertebrae. The right kidney is slightly lower than the left kidney to accommodate the liver. Both kidneys are bean-shaped and about the size of an adult fist. 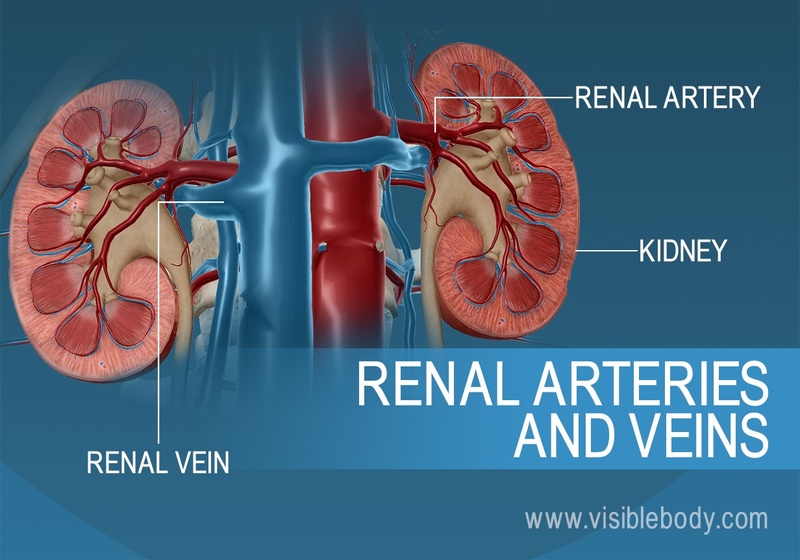 Blood enters the kidneys through renal arteries. These arteries branch into tiny capillaries that interact with urinary structures inside the kidneys (namely the nephrons). Here the blood is filtered. Waste is removed and vital substances are reabsorbed back into the bloodstream. The filtered blood leaves through the renal veins. All the blood in the body moves in and out of the kidneys hundreds of times each day—that’s about 200 quarts of liquid to be filtered every 24 hours. 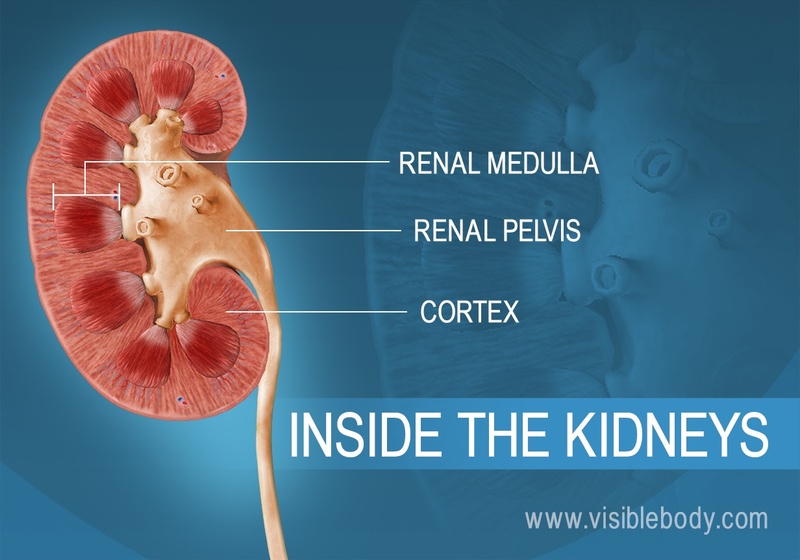 Each kidney consists of an outer renal cortex, an inner renal medulla, and a renal pelvis. Blood is filtered in the renal cortex. The renal medulla contains the renal pyramids, where urine formation takes place. Urine passes from the renal pyramids into the renal pelvis. This funnel-shaped structure occupies the central cavity of each kidney and then narrows as it extends out to join the ureter. Urine drains from the renal pelvis into the ureter. Each kidney contains over 1 million tiny structures called nephrons. The nephrons are located partly in the cortex and partly inside the renal pyramids, where the nephron tubules make up most of the pyramid mass. 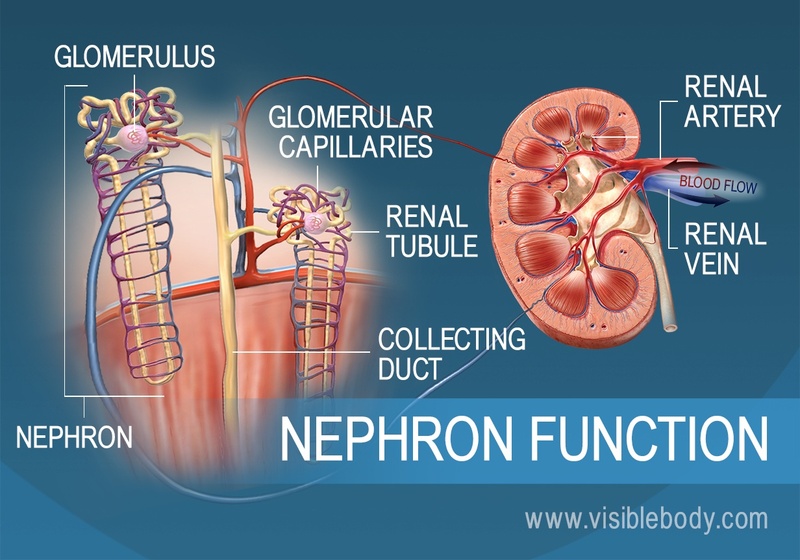 Nephrons perform the primary function of the kidneys: regulating the concentration of water and other substances in the body. They filter the blood, reabsorb what the body needs, and excrete the rest as urine. A cross-section of an adult kidney from the University of Utah Spencer S. Eccles Health Sciences Library. Study: Brain structure of kidney donors may make them more altruistic from Georgetown University.